Single pack of the Honeywell FC200E1003 MERV 13 Pleated Air Filter - 16" x 20" x 4". Brand new, genuine Honeywell air filter product. A factory original, OEM replacement filter for the Whole House Electronic Air Cleaner F200, F100, F150, F35, F25, F27. 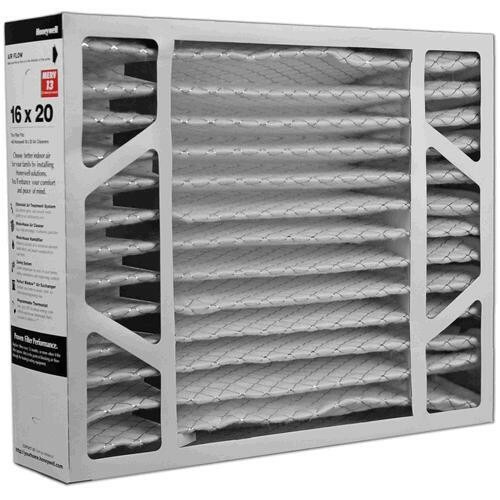 This Honeywell FC200E1003 air filter measures 16" x 20" x 4". Looking for a reliable product from a brand you can trust, all at an affordable price? Look no further. Since 1885, Honeywell has been providing customers with cutting-edge technology in the home comfort industry. From the first thermostat to today's innovative Indoor Air Quality products, Honeywell continues to be a leader in the home comfort market. Air filters have the ability to filter out particles and irritants from your air-handling system so the air in your home can be crisp, clean and clear. This helps to keep dirt out of the air, your home’s ductwork, and out of your heating and cooling components. Click Here to contact our Sales Department, or call 888-623-4678.